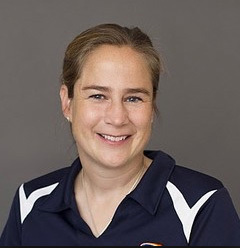 Sarah Dwyer-Shick is the Girls Goalkeeping Director and Assistant Girls Academy Director at Downtown United Soccer Club in Manhattan. In 15 years in intercollegiate coaching she coached at each of the three NCAA divisions and spent three years as an assistant with the Dutchess Community College NJCAA men's program. Sarah has worked with youth programs from the AYSO to Premier level in the U.S. and abroad. She spent nine years with U.S. Youth Soccer's Olympic Development Program in Eastern N.Y., serving as Director of the Girls North ODP program for five. Sarah earned her MSM from University of Denver and her BA from Smith College. She holds the U.S. Youth License and NSCAA Advanced National and Advanced National Goalkeeping Diplomas. Off the field, Sarah is on the Advisory Board for the Female Coaching Network. She is also the founder of The Sports Bra Project, a nonprofit that works to increase access to sports by providing sports bras to girls and women in areas where they are not easily accessible.